Today I'm giving some more tasting notes from a beer sent to me by Daniel Rohm. Daniel was nice enough to offer some of Tired Hands Emptiness culture he had grown up and blended with Wyeast 3726 and even sent a beer with it! He included a couple great beers I was really happy I'd get to try. I'll be sending a return box back soon! You can find his brewing post here and his tasting notes here on his blog. Keep checking back for more updates from him! He took a good base grain bill of a saison and then fermented it with a starter of 3726 and his grown up Tired Hands Emptiness culture. If anyone has ever had any of their Emptiness beers, you know that is some pretty amazing stuff. Those beers tend to have great stone fruit character and some pretty nice acidity. Poured into the glass it left me with about a finger to a finger and a half of nice white head and tons of different sized bubbles. Carbonation rolling up the side of the glass. The head dissipated pretty quickly. This was probably due to the acidity in this beer. When I popped the cap I got an initial whiff of acidity. 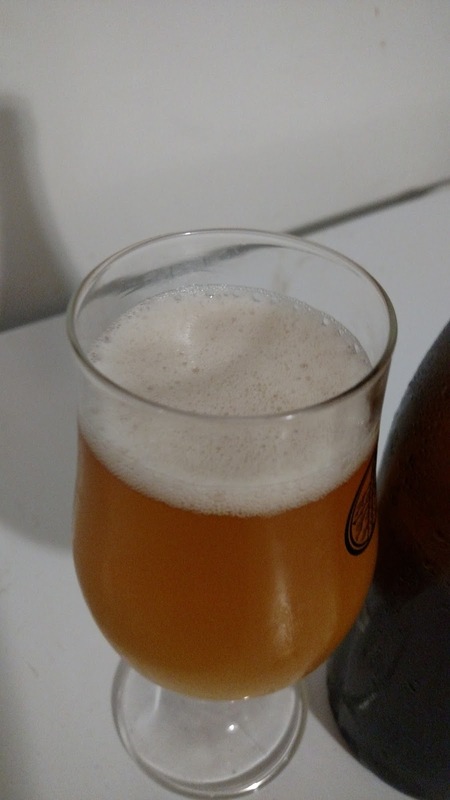 Just a tad hazy but I'm not one to look for crystal clarity in the beers I brew or drink. Golden orange in color similar to some of the beers I've been rolling out lately. Looks great. Head after I poured. I'll have better pictures soon! I've gotten a much better camera than my phone. First dive into the aroma I pick up the acidity in a lemon flesh and rind tartness. There is a big of pear skin and what smells like unripened peaches. The pear skin almost has a tannic quality but nothing off putting at all. There is a hint of funk that I'm sure will grow over time. Slight bit of acetic bite but nothing overpowering or even supremely noticeable. Could be perceived as a hint of vinegar but I'm not one to find this completely offensive. I actually like a little bit of that character if it isn't overboard. For the flavor, I pulled out some pear, maybe a bit of tart green apple, ripe peaches and apricot, very much Tired Hands character. Medium mouthfeel, and a little hangs on in the back of the mouth for the finish. Carbonation is nice and helps to clean the palate. There is a bit of malt flavor but nothing overly sweet at all. There is just a twinge of something shinning through remnant of ethyl acetate. It's highly possible that this is just the beer being young in the bottle. I'm sure that will age out. It's not offensive like nail polish or rubber at all. Just a hint of something I'm not able to put my finger on. I'm not sure what the ABV is but there is no trace of alcohol at all. Overall this is really nice stuff from what I think was, Daniel's second beer maybe? That's very impressive. He dove straight into all grain brewing and if this had been my second all grain beer I would have been stoked! Talking with him about fermenting with bottle dregs in saison I think we are both on the page of using the dregs more in secondary instead of co-pitching them with the saison yeast. 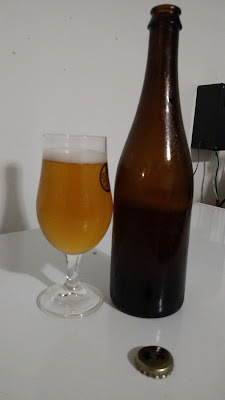 What I'm finding is just what he has said to me, that makes a beer more of a wild ale instead of the saison with a touch of tartness and brettanomyces funk. Thanks again for sending it my way, Daniel! Keep the brewing up and feel free to send more to sample! I'll have a box back to you with my HF dregs saison as well as some others.